I was born in a military hospital in Germany because my dad was in the Army. I’m the youngest of five children. I spent lots of my young years in New Albany, Indiana where I was corn-shucking and multiplication queen of my third grade class. I’m ambidextrous, which means I can write with both hands. I wore a wig to school my entire fifth grade year because I hated my hair. I had two dates to an eighth grade sweetheart dance in which I was a candidate for Sweetheart Queen. (whoops!) I apologized to both guys because one had asked me very, very early and I’d forgotten. It was awkward for awhile, but then all three of us shrugged, got on the dance floor and shook what our mommas gave us! Ended up being one of the best dances ever! In high school, I taught everyone in our choir to do the robot and we performed it in a concert. Like Lamar, I had asthma. I grew out of it, though, when I was 16. I’m married, have two sons and we live in Texas. My husband’s parents and siblings are from Tennessee and when they come to visit, we have a Texas/Tennessee bowling war where we all talk trash and try to bowl like Lamar. The raves are rolling in for her debut MG novel, HOW LAMAR’S BAD PRANK WON A BUBBA-SIZED TROPHY (Balzer + Bray/Harper Collins), and she’s as much fun to interview as her writing suggests. Why do you write? What inspired particular works — an image, a conversation, a person, a situation, etc.? Writing allows me to empty when characters fill my senses and beg for life. 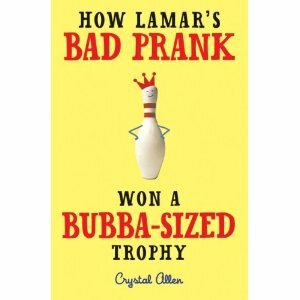 …How Lamar’s Bad Prank Won A Bubba-Sized trophy actually began as a ghost writing possibility. I didn’t get the job, but I loved my characters and wanted to do something with them. At that time, it was a chapter book, written in third person, with multi-cultural characters. 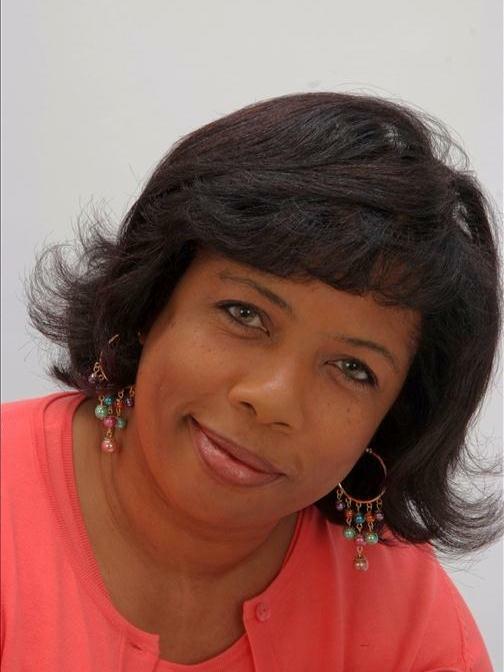 I got lots of encouragement and direction from incredible people like Bernette Ford, Christine-Taylor Butler, Eileen Robinson and Dara Sharif, but something just wasn’t right with that story, and I couldn’t put my finger on it. Can you describe some surprises along the way of a story? In following with what I said above, one day, in the middle of a CSI episode, a teenage, African-American boy began walking around inside my head like he owned the place! He was struttin’ like a crazy child! I honestly thought I might need some medical intervention! But soon, the mental scenery changed as this boy took me to a bowling alley. The smells, the sounds, and the kids bowling, made it clear who was strutting around my brain. I can’t tell you much about that CSI episode, but I can tell you that moment switched my story from third-person to first and changed everything between Lamar and me. What aspect of storytelling most appeals to you? I love dialogue. I build my stories around what my characters say, how they say it, and who they’re saying it to! I also like to close my eyes and type what I see in my brain. That’s a great exercise. But, if you’re going to try that exercise, make sure your fingers are on the right keys! My biggest challenge is keeping my personal thoughts out of the story. For instance, Lamar and I fought a lot. For example, one time, I hollered at my computer screen, flipped the hard drive switch to off, yanked the curtains closed and shut the door to my work station! And it was because I didn’t want Lamar to do something that he, as a thirteen-year-old boy, needed to do in the story. It was a very hard lesson for me to learn, but it was also a very good one. What led you to the children’s writing industry? For the longest time, I thought my two sons were tone deaf. Then, I realized it was just the tone of MY voice that they chose to ignore. Chores and homework were everyday struggles and punishments weren’t working. So, I decided to write an ongoing story, using them as the main characters. After a few weeks of that, I wasn’t sure which of us was enjoying it the most. So, I began to search the internet for organizations and conferences. What has kept you in? Can you describe some of the high and low points? I love it. I wish I’d started sooner. The lowest point was probably between 2005 and the end of Summer, 2006. I’d put a lot of time and money in to week-long conferences, expensive boot camps for writers, grueling workshops and of course, endless writing, but I still had no solid interest from the publishing world to show for it. I strongly considered quitting, believing that maybe I didn’t have what it took to be a children’s book writer. The highest point was in the Fall of 2006, when I contacted Dara Sharif, former Editor for Scholastic and Read & Rise Magazines–whom I’d met at a conference in Kansas City several months prior. I emailed her, hoping she would give me some direction on a story I was working on at the time. She immediately emailed back, told me to send her the story, informed me that she had lots of things on her desk that needed her immediate attention, but she’d get to it as soon as she could. THEN, she mentioned a story I had written and read aloud during that Kansas City conference where we’d met — a story that was actually an assignment for a class I’d signed up for. She bought my homework! My first sell! That one moment became a validation of my efforts, my reason to keep writing, and I will always be grateful to Ms. Sharif for that special moment. What publishing issues are important to you right now? What are you excited about? Digital publishing is an important issue that I’m watching because I think it’s going to dramatically change things in the near future. I’m excited about the rise of stories with persons of color as the main protagonist or antagonist. This was unheard of when I was growing up. I’m so excited for today’s child. The challenge for me will always be to put out a novel that’s sellable, viewed by my publisher as profitable, and highly enjoyable to my audience. Were there any people who played pivotal roles along the way? Yes. There were so many that I took up a whole page naming them in the back of my debut novel! My God brings me joy. My family brings me joy. Finishing a chapter or a scene that I was dreading, brings me joy. Traveling brings me joy. Any of the professional sports teams in Houston getting a win, brings me joy. Some favorite books you’ve read lately? Around Our Way on Neighbor’s Day by Tameka Fryer Brown, If a Tree Falls at Lunch Period by Gennifer Choldenko. What’s the best advice that you’ve gotten/or would like to give to writers today? Get rid of that voice in your head that says, “I can’t.” That voice is full of crackers and cream cheese, and is not the voice of truth. More humorous stories for middle-graders. Well, because Lamar is such a big-mouth in my head, I’ve had to switch and write a story about a girl. But, she’s hilarious and I’m having an awesome time helping her write her story! Visit Crystal online — you’ll be glad you did. Gotta love Crystal Allen’s spirit! She and her character Lamar sound like people I’d want to get to know. Thank you TBB for the fantabulous introduction! Thanks for your comment! Hope to meet you, too, some day! EXCELLENT bio! I just KNOW that there was all kinds of trouble gotten into by this author, and that fun and funky spirit will definitely shine through in her work. Can’t wait to read this and more! I hope you enjoy reading about Lamar! Ha, Crystal is hilarious! I know that readers everywhere are going to have fun spending time Lamar’s world. Thanks for checking out the interview. I pray you’re right about readers enjoying Lamar because I sure enjoyed writing the story! I am lookng forward to reading your book,that I’m sure will be as enjoyable as your bio..Thanks for sharing your wonderful talents..You have a wonderful future ahead cousin…. Thanks, Cousin Joel! Just trying to keep up with the talented Osbourne family! I appreciate you checking out my interview. Love you. Seriously, Crystal….you can’t imagine me in 5th grade. 🙂 It was that bad… 🙂 Thanks so much for reading my interview. And I’m so glad you found something in it to inspire you! I’m so happy for you! So glad you stayed on the writing journey. Your voice is fresh, memorable and real. Love the story of how Lamar was born. Your testimony is inspiring. Wish you much success, my friend. Enjoy this special time. You deserve these blessings and much more. From the writer’s workshop in Chautauqua, where we first met, to now and forever, I’m so proud to call you my friend. Thanks for your kind words. Sounds like a stellar childhood. I love the wig wearing episode. I had one of those myself. This is a very enlightening interview. I love to hear about the journey to publication. It keeps me inspired. Thanks for checking out my interview. Wow, you have a wig story, too? Geez. 🙂 I’m so glad you enjoyed the interview and my path to publication. Hopefully one day we’ll meet and chat face-to-face!